Upon request, Isaac (Mark Jackson) – who learned to play the piano in one millionth of a nanosecond – plays something "sweet and jazzy" for Dr Finn (Penny Johnson Jerald) which turns out to be "As Time Goes By" – a reoccurring song in this week's episode. Spoilers ahead. Deflectors Up. Standby Quantum Drive. Finally, 12 months and 23 days after the last episode of Season 1, "Mad Idolatry," showed the crew of the USS Orville discovering a multiphasic planet and Cmdr. Kelly Grayson (Adrianne Palicki) accidentally becoming a deity, fans have been rewarded with the first episode of Season 2. In the first episode of the second season, Lt Cmdr Bortus (Peter Macon) must return to his home world, Moclus, to perform the ceremony of Ja'loja and urinate, since members of his species only do this only once a year. It's safe to say that the very first episode of Season 1 was slow to start, but then that could be said of almost any new sci-fi show. ("Encounter at Farpoint" anyone? Yawn.) 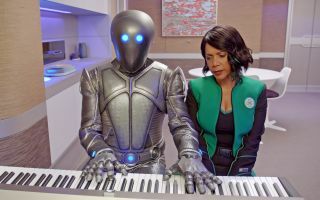 However, "The Orville" quickly picked up the pace and soon offered us some great episodes, including "Krill" (S01E06), "Cupid's Dagger" (S01E09) and "New Dimensions" (S01E11). Thankfully, Season 2 opened with an episode that felt as perfectly polished as the very best of what we've seen so far, with a string of different subplots all beautifully tied together — but more on that later. It begins with an opening shot of Capt. Ed Mercer (Seth MacFarlane) propping up the bar in the ship's mess, hunched over what looks like a large Jack Daniels and pouring his heart out to the alien bartender, Olix (played with artistic understatement by Jason Alexander). In the background, "As Time Goes By" by Dooley Wilson can be heard, most likely a homage to Rick from the movie "Casablanca," who was in a similar relationship situation as Mercer is. This song is used brilliantly to tie together all the failing attempts at romance taking place aboard the Orville, which form the backbone of this episode's storyline. Suddenly, Lt. Cmdr. Bortus (Peter Macon) enters and announces something of great importance. Referring back to a joke used in the first episode of Season 1, "Old Wounds," Bortus reminds us that members of his species urinate only once a year…and it is his time. Consequently, they must return to his home world, Moclus, so that he can perform the annual ceremony of Ja'loja and ultimately relieve himself. Thankfully, MacFarlane doesn't let this golden opportunity for water-closet wit dominate the story; instead, the issue of finding a date for the ceremony becomes central, since it is considered bad luck to attend Ja'loja without a partner. It's tricky to tell exactly how much time has passed since the end of Season 1; we see Topa, the son of Bortus and Klyden, and he looks like he's about age 4 or 5. However, we have no idea how fast Moclan males grow, so this doesn't mean a great deal. Judging by the still-unresolved situation between Mercer and Grayson, it would appear that no more than a few months have passed. As we saw at the end of last season, Mercer has forgiven his ex-wife and first officer for sleeping with Darulio (Rob Lowe) while under the influence of Retepsian pheromones and is still very much in love with her. The relationship woes of all types continue throughout the episode. Lt. Gordon Malloy (Scott Grimes) tries and fails to ask the new dark-matter scientist Lt. Tyler (Michaela McManus) to go as his date to the Ja'loja. Lt. Alara Kitan (Halston Sage) goes on a date with Lt. Dann (Mike Henry) arranged by Bortus, which quickly disintegrates, and Mercer performs a "fly-by" in a shuttle past Grayson's quarters so he can spy on her and learn whom she's dating. Meanwhile, Dr. Claire Finn (Penny Johnson Jerald) is having relationship problems of a different nature. Her two troublesome young children, Marcus (BJ Tanner) and Ty (Kai Wener), are proving something of a handful. The older of the two, Marcus, is being led astray by a bad kid at school, and poor Dr. Finn is questioning her own parenting skills. Thankfully, Isaac (Mark Jackson) is on hand to offer his unique perspective, much like he did in "Into the Fold" (Season 1, Episode 8). Eventually the situation gets resolved in a parent-teacher meeting with a well-balanced mix of seriousness and humor. And in fact, that sums up this first episode: a well-balanced mix of seriousness and humor. Following the various dating disasters, Bortus performs his Ja'loja without incident and everyone returns to the ship. Lt. Cmdr. Bortus (Peter Macon) performs his annual Ja'loja ceremony as invited members of the crew look on. The final scene of the episode depicts Mercer at the bar once more, nursing a large Jack Daniels as Lt. Tyler approaches and sits next to him, offering viewers the tantalizing thought that perhaps she might become the captain's new love interest. However, according to IMDb, she's not credited as that specific character in any more episodes in Season 2. McManus has, however, played a number of different characters in "The Orville," so we may see the actor even if we might not see Lt. Tyler again. At another end of the bar Malloy confides with Dann, Grayson shares a kiss with her new beau, Cassius (Chris Johnson), and Dr. Finn thanks Isaac for all his help. And playing in the bar, in the background, is "As Time Goes By." The first season of "The Orville" is available to buy on DVD and a season pass can also be purchased from Amazon. After the special premiere time, the second season of "The Orville," which will comprise 14 episodes, will take up its regular spot on Thursdays at 9 p.m. EST on Fox in the U.S. — putting it right up against the new season of "Star Trek: Discovery." The U.K. and Europe have to wait until , Jan. 10 at 9 p.m. GMT for the Season 2 premiere on Fox.